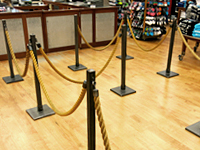 We have introduced top quality queue management products for diverse retail outlets. These products have proven to improve customers waiting experience by reducing wait-time. Our range of product selections are designed to not just cater major chain stores, but also mom and pop shops who have crowd control needs. 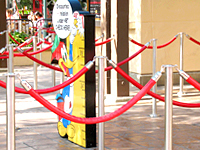 Our queue barrier products are broadly used in several entertainment centers. Our huge number of clienteles in the entertainment sector includes theaters, galleries, museums, clubbing, theme parks and aquariums. To differentiate from the retail units, these entertainment centers need to manage queue in more attractive and decorative manner. Our products such as decorative posts and ropes serve the need flawlessly. We implement state of the art crowd control equipment for food service industry. 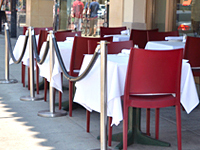 Our product variety such as retractable posts and sign frame work out perfectly for restaurants and fast food chains. These products help to increase customer service and efficiency of the food service outlets. Institutions such as banks, schools, hospitals and other religious facilities require not only organized, but also safe and efficient management of crowd for security reasons. With diverse range of barricades and queue barrier products, we can proudly announce that we have numerous satisfied clients for this application. We have developed products that help the customers to remain engaged while waiting for service. 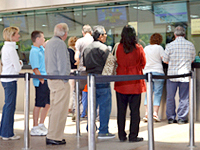 Smooth customer flow is necessary when transporting passengers from one location to the other in airports, train stations, bus terminals, cruise ships as well as car rental agencies. 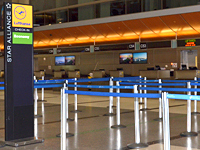 In the past, we have successfully introduced several crowd control products that help transportation industry deal with challenges related to queuing which have dramatically advanced customer waiting experience. With our equipment in place, our clients won’t have to worry again even when lines are getting longer than before. Hospitality industry involves hotels, casinos, restaurants and other facilities that customer satisfaction is a priority. It is fairly common to see different applications of crowd control equipment that are being applied. 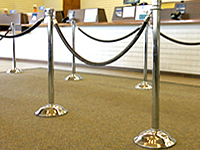 Usage of barrier rope and other queue management products don’t seem like an obstruction for the consumers under this sector. Since this industry has direct affect to the customer, our decorative posts, ropes and barriers are perfect for this purpose.